Welcome to the second part of my annual Top 10 17 list. Today, I will be going through my favorite “big” cars that I have acquired in the past year. This list is not limited to just the models released in 2017, so you will find old, rare gems alongside modern pieces. Again, everything here is based on my own opinion, what I have, and my preferences when it comes to cars. It’s hard to believe how this collection has grown in just the past year and a half. Truth be told, I’ve probably been collecting too fast. The stable stands at over 150 models now, and I’m already seeing the effects; I’m no longer buying models left and right like I used to, because there really isn’t a whole lot left that I need. A year from now, I wouldn’t be surprised if I’m completely finished with this scale, save for the occasional new release. I guess that’s a good thing, because there’s plenty of other endeavors I can throw my money at. That being said, I still “hunt” on a regular basis. You never know when you might come across a steal on a valuable AUTOart. GT Spirit and Otto crank out fascinating new models every month to keep you on your toes. When CK does one of those massive price slashes, you know it’s time to empty the wallet. Let’s just say that diving into this scale is not for the faint of heart. I’ve warmed up to the design of the current crop of McLarens, so I had this on my radar for a while prior to its release. Kyosho’s Ousia line hasn’t been the best detail-wise, but you wouldn’t know if you only had this model in hand. They’ve stepped it up in a big way - it’s metal, it looks great, and it won’t break the bank. It’s the M3 GTS by GTS...pirit. This is an older model that took me a long time to find at an attractive price but, as always, you will find it if you keep looking. GT Spirit’s range of E92 models is the best in the market and outshines any of its Kyosho rivals. I was lucky enough to score not one, but two, of these pignose STi’s at absolute steals. I’m going with the white over the black one here, as it’s my favorite color for this car. These go for around $300 on the market, yet I got them for about a third of that. As has been stated before on this forum, you can’t go wrong with old AUTOart’s. Pink! All cars, Lambo or not, should be available in this color. This AUTOart’s got it all with the details and opening features. Not cheap, but the pink alone was worth the premium (for me) over some of the less expensive colorways. The F40 might be my most detailed model yet. My favorite aspect of this model is the realistic suspension - the wheels droop when you lift the model up, then return to its aggressive stance when you set the car down. Even better, it was a steal at just $120. Best Minichamps ever. I’ve been highly critical of them in the past, but this is one exception where the model is actually worth the money. I suddenly don’t feel the urge to upgrade to the AUTOart anymore. And, unlike the AA, it’s available with gold wheels. The past couple months have been dominated by R32's, thanks in large part to CK putting all of the Bathurst variants on clearance. I grabbed one of each variant for myself, but this Nismo is way cooler than any of those. This is my only “stock” R32, and I like it that way. They’re quite hard to find, but I snatched Godzilla away for only $99. Let’s forget for a moment that the wheels are totally wrong. I just can’t get enough of Humpty Dumpty here, whether it’s because of the sparkling blue paint or the buttery brown interior. The detail inside is amazing, far better than what you would expect from a low-mid level brand. For $45, I thought “why not?” One of the best decisions I made all year. As a fan of the 996 (no shame at all), you know I couldn’t make a Top-whatever list without one. I looked at the trio on my shelf and went with the GT3 because it was the one I expected to like the least but ended up liking the most. Doesn’t matter which one you pick though, because all of them are as detailed as any AUTOart you can buy today. Samurai models are generally ripoffs, but it’s the subject matter that counts. The 4-door sports car is my favorite segment in the automotive industry and one that is oft forgotten in scale models. The GS is the best-looking car in its class, a perfect combo of sleek and aggressive, making this one of my most anticipated models of 2017. IS-F, anybody? It’s been a long time since we last saw the Z32 in 1:18. The last time it appeared was in the early 2000's with the Kyosho. It’s a fine model but clearly shows its age. Now, we get one that finally looks right; on top of that, GT Spirit will release its own version this month. The Z is back! Modern AMG’s have taken a step back in design, but the C63 coupe has grown on me ever since I acquired this model. For me, it looks best in this dealer-exclusive white color with the black wheels. 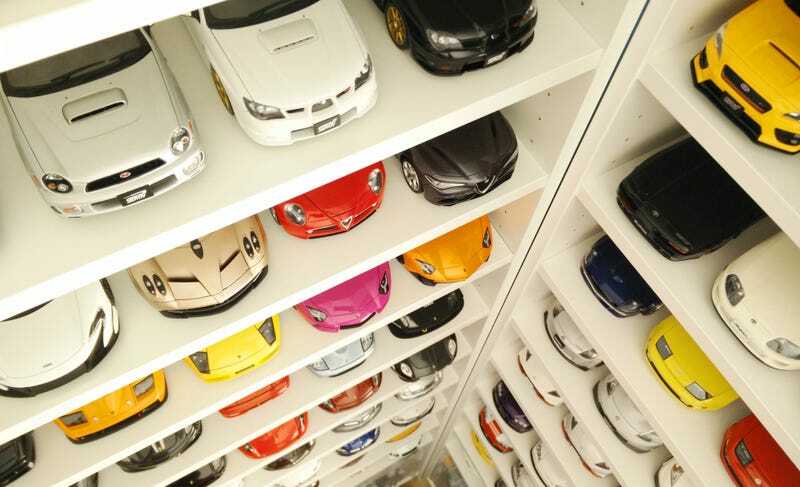 A fan favorite, the Integra has strangely been missing in this scale...until now. It’s my favorite Honda, so I had to pick up both colorways of this release. The yellow, an Asian hobby exclusive, is my choice of color for the ‘Teggy. It’s no secret that I’m a huge Nissan fan, so the rest of this list will be rather pointless for those of you who aren’t. The Nismo 370Z is yet another one of those older GT Spirit models that took a while to track down, but the efforts were worth it. I much prefer this first edition of the Nismo over the current one because of its extreme styling. I’m putting the holy grail at #3. There are times when I look at it and go “damn, I can’t believe I actually have this!” I paid a hefty sum to have my grail (~$250), but it was the only one I ever found under its actual market value. The Ultimate Opal Black color makes the SpecV special, a very dark purple that you can’t really see in pictures. Mines, mines, MINES!!! This is what you call a tastefully-modified tuner car. Everything about it - the stance, the wheels, the well-placed decals - is so perfect. I really wish I could collect more of these Ignition models, but they’re just so damn expensive. I have to pick and choose carefully, and it looks like I was successful in doing so. Model of the year, both in terms of subject matter and execution. I don’t think anyone expected Otto (or anybody else for that matter) to bring out the S14, but they did and did it well. The Fuschia purple is an awesome color choice, and I like that they kept the car stock, unlike the ones you see on the road. They just released the S13, so one can hope that the fan-favorite S15 arrives somewhere down the line.